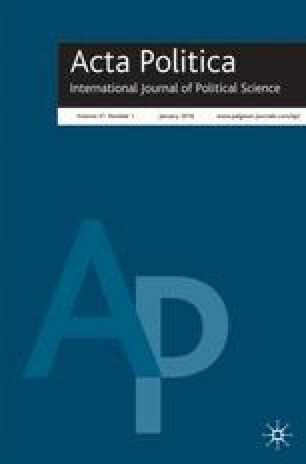 We take up a longstanding question within the field of European Union (EU) studies: What explains the variation in public support for European integration? There are two dominant explanations: the utilitarian self-interest and the national identity perspectives. The former viewpoint stresses that citizens are more likely to support European integration, if it results in a net benefit to their economy or pocketbook, while the latter perspective argues that identity considerations predominantly influence EU support. Drawing on the concept of double allegiance, we argue that these perspectives should be combined into one single explanatory framework rather than framed as alternatives. Using a multilevel model, we empirically substantiate the claim that interest- and identity-based explanations capture different sides of the same coin, as the more citizens perceive integration to threaten their (economic and social–psychological) security and well-being, the less likely they will support the EU. This index is centred on the mean. Generally speaking, do you think (your country's) membership in the Union is a good thing, a bad thing or neither good nor bad? (1) good thing, (2) bad thing and (3) neither good nor bad (recoding 1=1, good thing, 2=3, neither good/nor bad, 3=2, bad thing). If you were told tomorrow that the European Union were scrapped, would you be very sorry about it, indifferent or very relieved? 1=very sorry, 2=indifferent, 3=very relieved. In general, does the European Union conjure for you a very positive, fairly positive, neutral, fairly negative or very negative image? 1=very positive; 5=very negative. Does the EU give you personally a feeling of…? 0=enthusiasm, hope, trust; 1=indifference, anxiety, mistrust, rejecting it. A dummy variable based on the following question: ‘In the near future, do you see yourself as (1) [nationality] only, (2) [nationality] and European, (3) European and [nationality], or (4) European only?’ (recoding: 1=1: nationality only, 0=2,3,4: nationality and European, European and nationality, European only). 1. What are your expectations for the year to come: will 2004 be better, worse or the same when it comes to the financial situation of your household? 2. What are your expectations for the year to come: will 2004 be better, worse or the same when it comes to your personal job situation? Combined index measuring trust in political parties, national government and national parliament (1=high trust; 6=low trust). This index is centred on the mean. (The dimensionality of six trust items measuring trust in political institutions was using a scaling procedure called Mokken Scale Analysis for Polychotomous Items (Debets and Brouwer, 1989)). The procedure extracted one dimension including trust in political parties, national government and national parliament with a scale coefficient of H:0.57 (strong scale). On the whole, are you very satisfied, fairly satisfied, not very satisfied or not satisfied at all with the way democracy works in your country? 1=very satisfied; 4=not satisfied at all. What is your current occupation? 1=manual, unskilled worker; 0=other type of worker. What is your current occupation? 1=professional, skilled worker; 0=other type of worker. Total level of public expenditure as percentage of GDP. Source: OECD Economic Outlook 76 (http://juno.sourceoecd.org; access date 12 May 2005). Dummy variable indicating if a country is a member of the Euro zone (1=yes, 0=no). % of votes of these parties in last parliamentary election prior to 2003 (www.electionworld.org; access date 12 May 2005). Percentage change in inflation from 2002–2003. Source: OECD Economic Outlook 76 (http://juno.sourceoecd.org; access date 12 May 2005). Standardized unemployment rate 2003. Source: OECD Economic Outlook 76 (http://juno.sourceoecd.org; access date 12 May 2005). Note: All parties included here (1) received at least one parliamentary seat or 2% of the vote in the last parliamentary election prior to 2003 (Source: www.electionworld.org) and (2) can be classified as EU-sceptical and rightwing extremist on the basis of country expert judgements (Source: Chapel Hill Expert Data Set on European Integration 2002, see http://www.unc.edu/%7Ehooghe/data.htm).